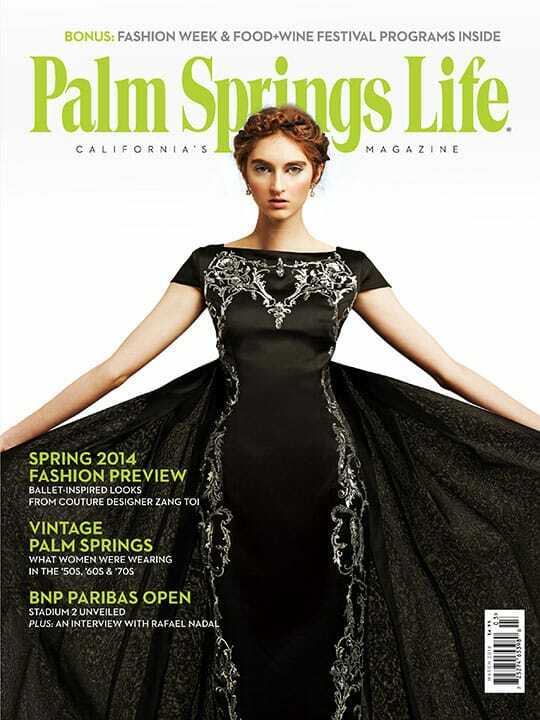 ON THE COVER – Fringe Dress by Herve Leger, $1,640, at Saks Fifth Avenue; 18-karat gold link bracelet by Nicolas Cola, $19,100, at Frasca Jewelers; both on El Paseo, Palm Desert. Photo by Jiro Schneider. By Liz Mazurski. Photography by Lance Gerber/Nuvue Interactive. A high desert home harmonizes design and nature. Earn a spot on the best-dressed list at this year’s music festivals with free-flowing, bohemian-riche styles. By James Gilbey. Photography by Calder Wilson. When you think you’re too old for Coachella, a Bedouin-style tent is the way to go. Musicians have been finding creative inspiration in the magical settings of the Coachella Valley since the 1950s. Wrap yourself in luxury, from soft cashmere loungewear to sensual silk sheaths. Music fills the Coachella Valley this month. Jeffrey Sanker ups the ante in celebration of his annual White Party Palm Springs’ silver anniversary. Eco-minded fashion designers stitch sustainability with style. Harriet Allen Lefevre, one of the original owners of Pappy & Harriet’s Pioneertown Palace, reminisces about the famed roadhouse’s rootsy beginnings. Record Alley, which has been in the valley for 36 years, scratches the digital trend with new vinyl and old-school music memorabilia. 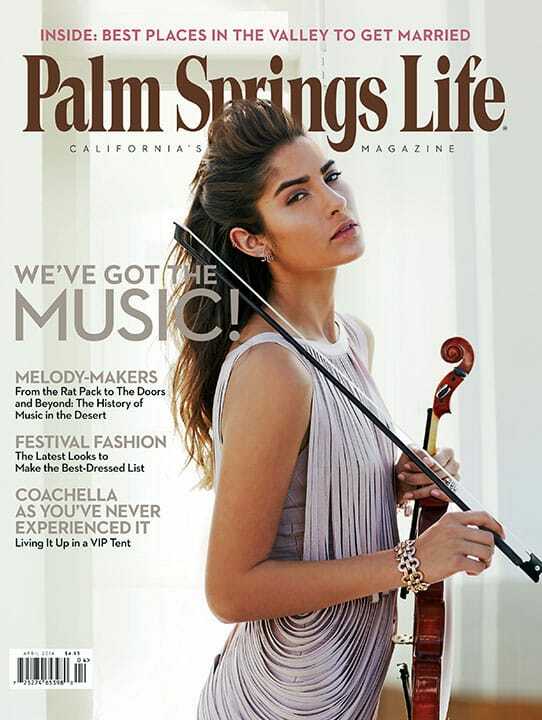 Desert Symphony celebrates its 25th anniversary with a gala April 12, featuring guest performer Michael Bolton; Palm Springs Life steps behind the curtain with the symphony’s conductor, Gary Berkson, who shares stories from the grand stage. An open floor plan, outdoor living, and an array of luxury amenities make this Bighorn residence the ultimate “staycation” home. The latest findings reveal more about who’s purchasing local homes. The power of the lunar eclipse. 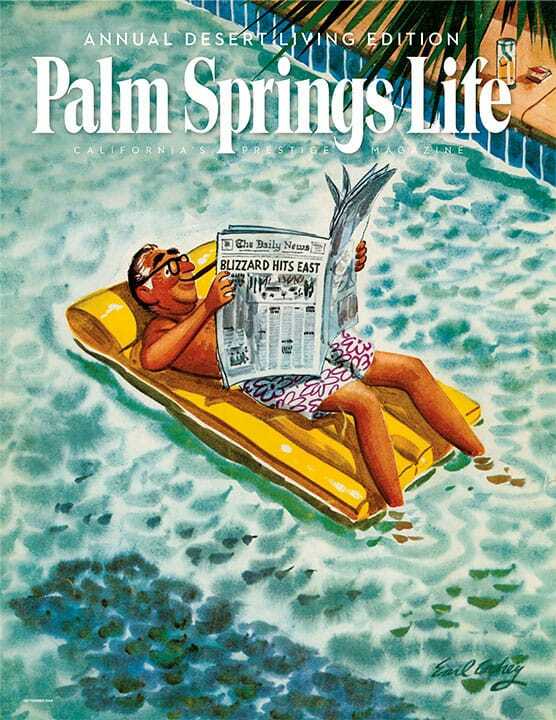 Palm Springs Life partnered with Five Star Professional to find outstanding wealth managers in the Coachella Valley.